I've only just discovered the wondrous Northumberland store, RE, which specialises in locally made, original, recycled products and found objects. 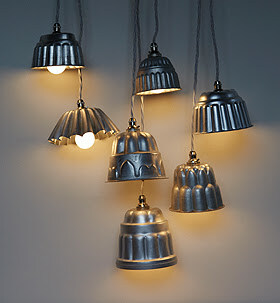 More about them soon but for now, how cool are these quirky vintage jelly mould lights (£48 each)? Check out the online store at www.re-foundobjects.com and keep an eye out for their 700sq foot, 4th floor permanent store-in-store which opens at Liberty in March selling rare, recycled, rescued and restored homewares and accessories. You can also visit them at their Corbridge shop, half an hour from Newcastle, at Bishops Yard, Main Street, Corbridge, Northumberland NE45 5LA.